The Sydney Bears defeated the Newcastle Northstars 5-3, in its Wilson Cup match at Hunter Ice Skating Stadium on Saturday 9th April. Preseason hockey can be a bit hit and miss due to the unavailability of players due to Worlds and the yet to arrive Imports but the game was played at a good pace and in good spirit. What’s exciting is the depth of East Coast Super League and AIHJL players on the ice. Let’s look at what impressed me in this game. The Newcastle Northstars line up contained a good number of it’s AIHL players but the stand outs were Hamish Powell, Pat Nadin and Jaysen Chalker. Powell is skating with good speed and has fine tuned his body checking, driving opponents into the boards with vigor with the crowd holding it’s breath when they see him lining up his prey. For the Sydney Bears it was hard to go past Tyrell Clare, Geoff Irwin and William Dores. Clare will be one to watch in the AIHL in 2016, as he has returned form his season playing for the Vancouver Rangers, a stronger and more physical player. There was a lot to like about the game and for me it was the sheer amount of young talent that made you stand up and take notice. This entry was posted in Game Reviews and tagged AIHL, Australia, Craig Tonks, Debra Jean Photography, Geoff Irwin, Hamish Powell, Hockey, Ice Hockey, Ice Hockey AIHL, Jaysen Chalker, Newcastle, Newcastle North Stars, Pat Nadin, Sydney Bears, Tyrell Clare, Vancouver Rangers, William Dores on April 9, 2016 by craigtonks. When Beau Taylor returned to the Newcastle North Stars last week it was evident he had been working on just more than his hockey. He returned to Newcastle with a very impressive flow, which for people still new to hockey means an impressive mane of hair, a hirsute human being. A quick look around the league and you will see some impressive hair. 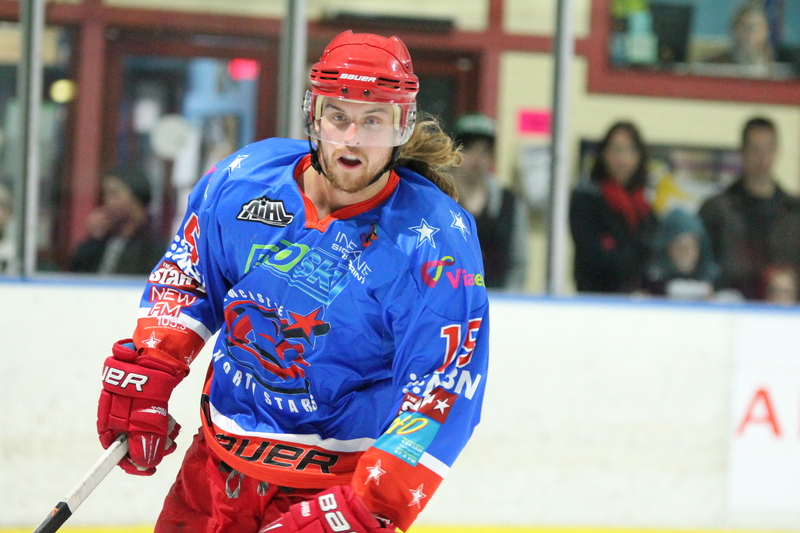 Beaus team mate, Jaysen Chalker has made some impressive flow gains in 2014 and was a team leader until Taylors return. One the comes to mind is Viktor Gibbs Sjodin, which may be more on the fro side then long but impressive to say the least. Add in his stable mate of Tom Voller and you have impressive hair that well and truely meets the flow requirements. Down at the CBR Brave we have Shai Rabinowitz who worked on his flow over the Aussie Summer up on the North Coast, although Derek Walker beats him on length. Over at the Melbourne Ice, Todd Graham meets the requirements of the flow club membership. Who’s your nomination for the Flow Club? This entry was posted in Articles and tagged AIHL, Beau Taylor, Derek Walker, Flow, Ice Hockey, Jaysen Chalker, Newcastle North Stars, Shai Rabinowitz, Sport, Todd Graham, Viktor Gibbs Sjodin on July 29, 2014 by craigtonks. The Newcastle North Stars kept their slim finals hopes alive with a thrilling 4-2 win over the Melbourne Ice on Saturday night at the Hunter Ice Skating Stadium. 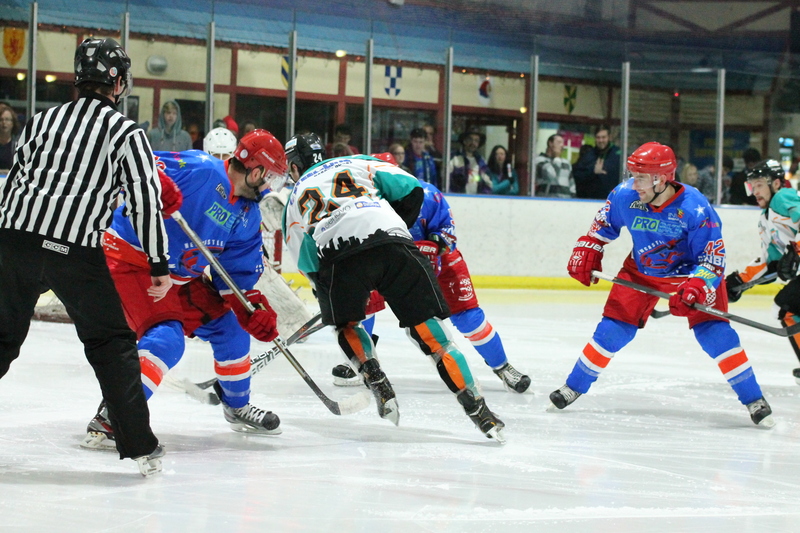 The previous weekend saw a hard fought match in Melbourne where the penalties proved costly to the North Stars yet it still proved to be a close match. The North Stars got off to the start they were looking for when an early power play saw Adam Geric grab an early lead for Newcastle. The Ice hit back at 5.07 when Tommy Powell leveled the scores at 1-1, yet with only 2.00 remaining in the first period Cody Danberg sent the North Stars to the break with a 2-1 lead. The second period became a grinding battle yet neither team could exert the dominance required, mainly due to the men in the red pipes, Harrison May and Gustaf Huth. A delay of game with only 3.40 remaining in the second period against Rob Starke, proved the opening Matt Armstrong needed to level it up at 2-2. As the clock ticked down history repeated from the first period when with a mere 0.16 left in the period, a Beau Taylor goal gave the North Stars a 3-2 lead. Season 2014 of the AIHL has shown anything can happen in the 20 minute third period. Again it was the goal tenders who dictated that the score would remain close with only one goal to be scored. At 13.16 Cody Danberg grabbed his second goal of the night to give the North Stars a 4-2 lead. One of the understated factors for the North Stars was the Newcastle defence with the John Kennedy Jr factor, who had a hand in three of the Newcastle’s four goals. While a loss to the Ice still keeps them at the pointy end of the table, the win was crucial to keeping the hopes of the North Stars alive. This entry was posted in Articles and tagged AIHL, Australia, Beau Taylor, Cody Danberg, Harrison May, Hockey, Ice Hockey, Melbourne Ice, Newcastle, Newcastle North Stars on July 29, 2014 by craigtonks. The Sydney Ice Dogs returned to the Hunter Ice Skating Stadium on Sunday night, this time for a North Stars home game. The North Stars got off to a great start in the first period, with goals to Robert Starke, Jaysen Chalker and Brian Bales and appeared to have sorted out a few issues in the goal scoring area. The return of Beau Taylor saw him add speed to the line up and the line with Hayden Sheard and Matt Wetini looks like it will bear fruit further into the season. 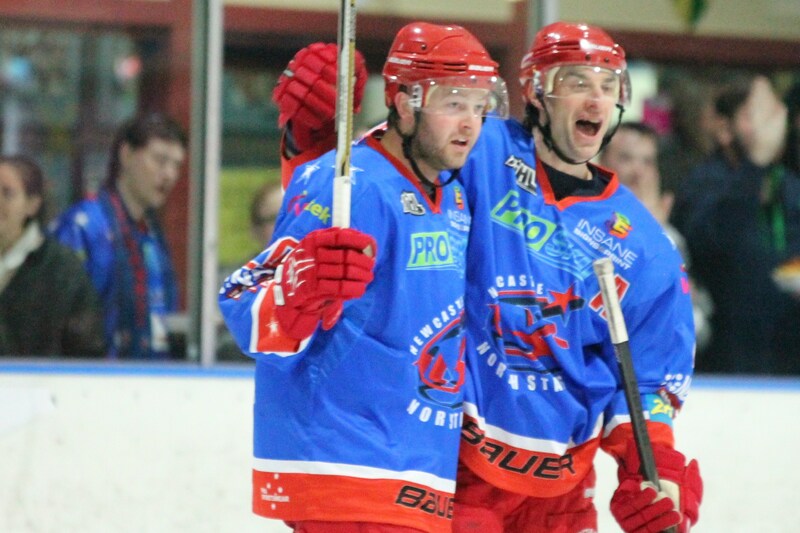 The Ice Dogs started a fightback that would see the period finish 3-2 after goals to Shane Southwood and Billy Cliff. The Ice Dogs were served well up the ice by Richard Tesarik and Paul Baranzelli who started to dominate the neutral zone. The second period saw a goal to Richard Tesarik at 11.39 but the battle raged along the boards with David Dunwoodie checking anything that moved. The North Stars had plenty of opportunities however it was only the goal tending of Tom Noting that prevented the scoreline from moving further ahead in he scoreline. The third period began at 3-3 and after goals to Adam Geric for Newcastle and Billy Cliff for Sydney, would see the score finish at 4-4 and head to a shootout. After attempts by Chris Wilson and Richard Tesarik, which both resulted in saves by Harrison May and Noting, it would be Simon Barg to put the Ice Dogs up 1-0. A miss by Beau Taylor added pressure to the North Stars however another miss to Brian Bales would give the Ice Dogs a shootout victory. A highlight for the Ice Dogs and one to watch in the future, was the performance of young gun, Lachlan Allport. The North Stars showed that the return of Beau Taylor will add another dimension to their attack and that could surely be the last piece of the puzzle the North Stars need. This entry was posted in Game Previews and tagged AIHL, Australia, Beau Taylor, Billy Cliff, Dog, Hayden Sheard, Hockey, Ice Hockey, Newcastle, Newcastle North Stars, Sydney Ice Dogs, Tim Noting on July 19, 2014 by craigtonks.